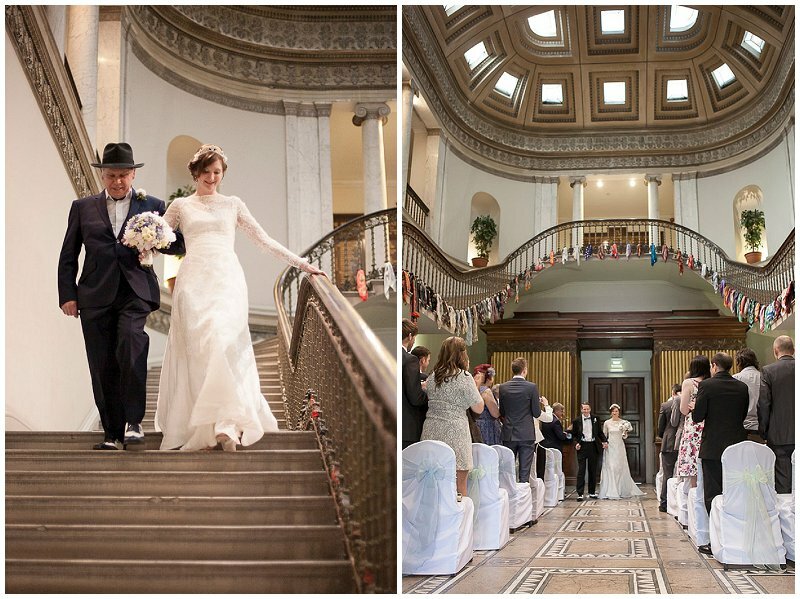 There are more details in Laura and Andrew’s day than you can shake a stick at. 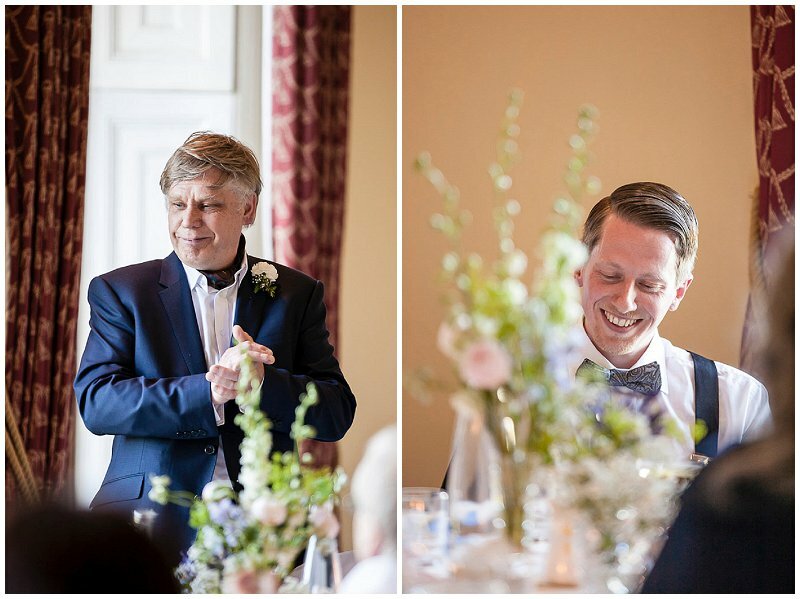 The bridesmaids are in perfectly contrasting outfits and the groomsmen are just as suave. Add into the mix afternoon tea with vintage china and a dress from the 1940’s and this swiftly becomes a wedding I wish I was at. More importantly, Laura and Andrew’s day radiates sheer and utter happiness. I just love it! 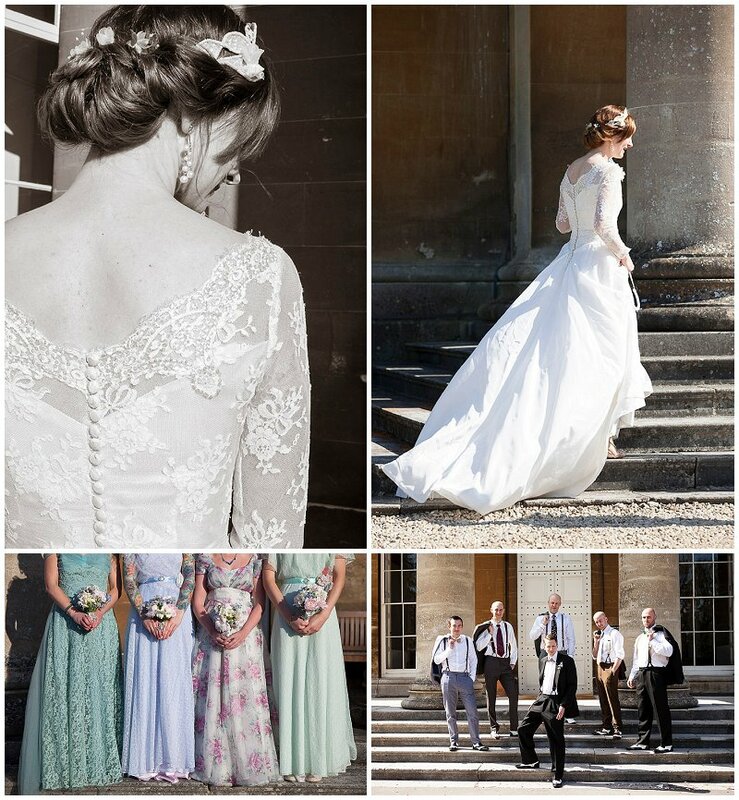 This wedding is shot by Charlene Morton Photography, a UK photographer in the West Country. 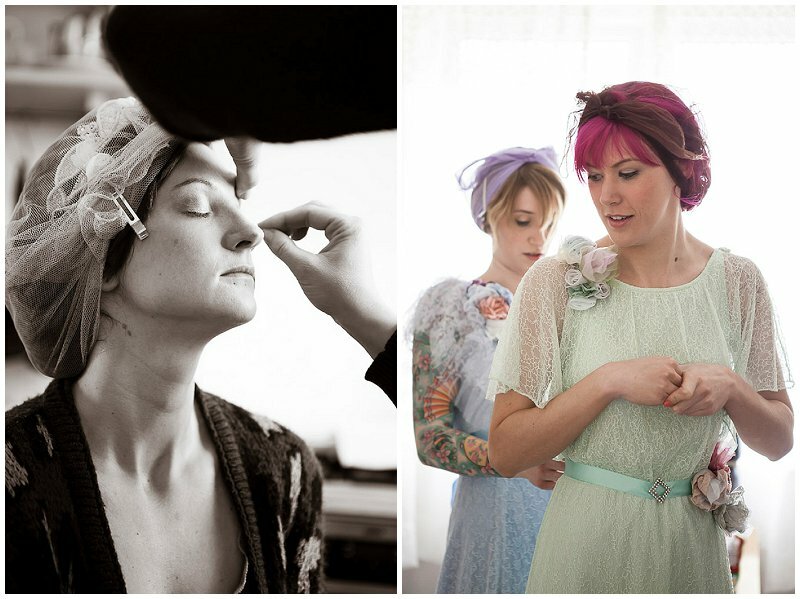 The morning of the wedding began at Laura and Andrews Bristol home, where the bridal party preparations were well underway. Hair and make-up artists had set up camp in the kitchen with boxes of rollers, brushes pots and powders. As we arrived the bridesmaids had their hair set and were all in coloured hairnets which held their curled and pinned hair-dos in place. 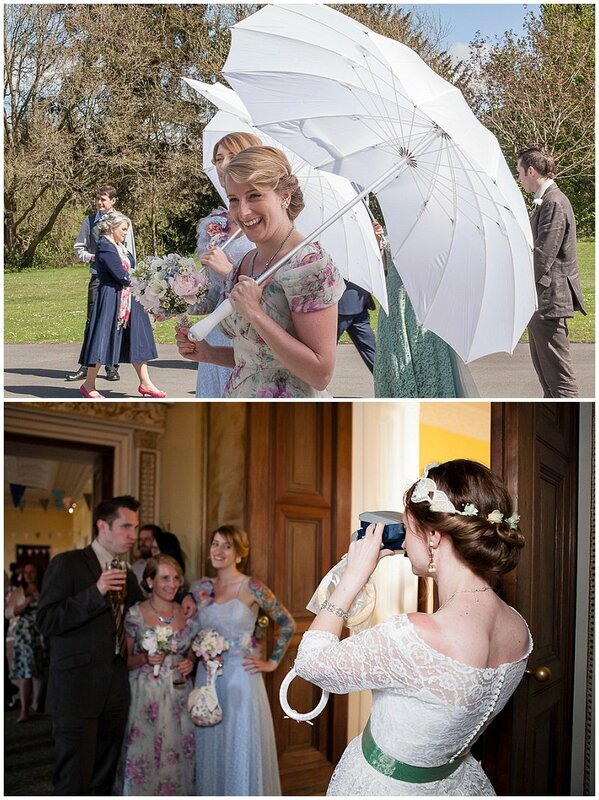 The bridesmaids dresses were all vintage, and had been painstakingly sourced by Laura. 4 long laced prom style dresses (some of which had been hand-dyed pastel tones) were all authentic vintage, absolutely beautiful and were as if they were made to suit each of the girls. The addition of handmade flower corsages tied the bridesmaids together seamlessly. 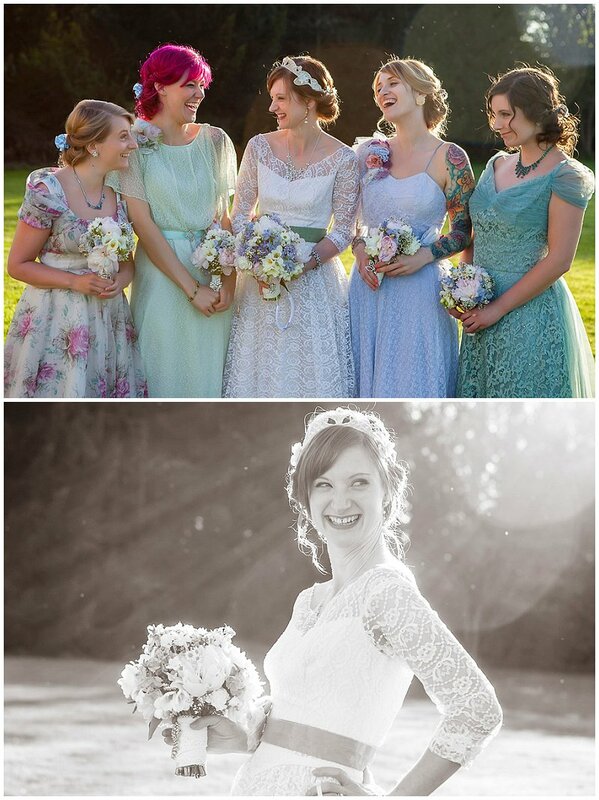 Laura had also sourced matching coloured vintage costume jewellery for each of her bridesmaids which was presented as gifts in dainty handbags she had hand sewn! 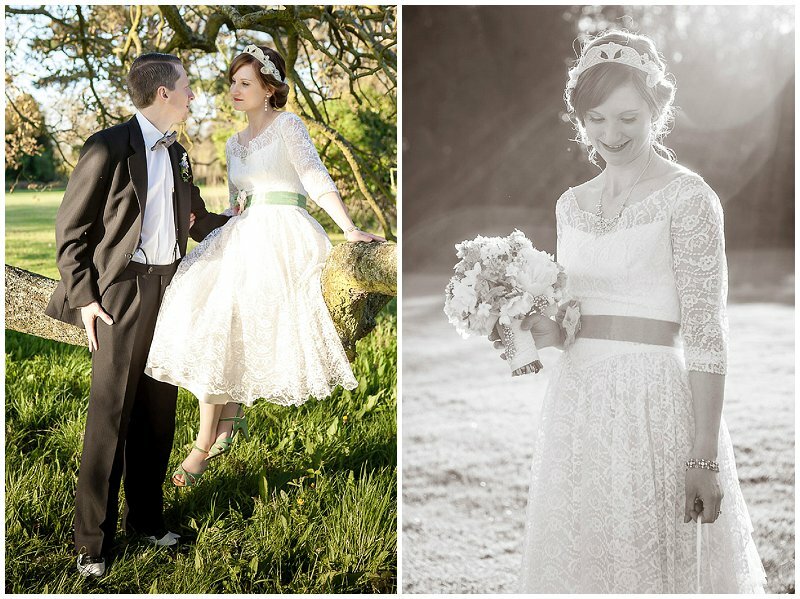 Laura’s 1940’s vintage dress had been sourced from America, and was found in a dusty trunk which had not been opened since the wartime. A really incredible find! 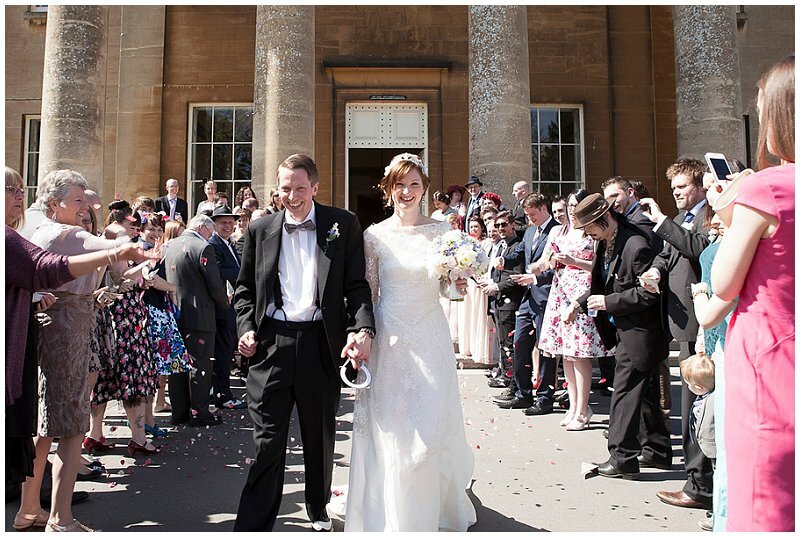 The dress had been shipped to the UK and altered to reduce the skirt size to a more A-line shape to modernise slightly and fit Laura perfectly. Delicate long lace arms and a high laced neck The preparations were a wholly relaxed morning of fun, smiles and friends. 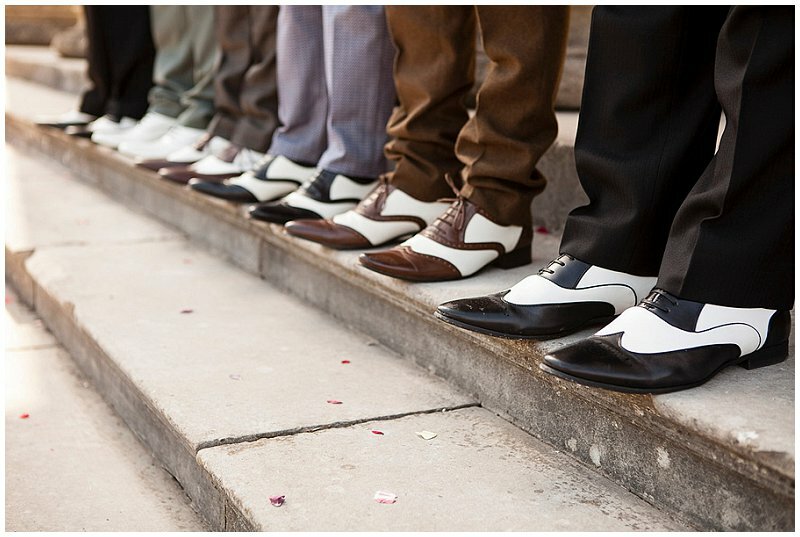 The grooms party arrived, each with flashes of 1940’s inspiration, from the quiffed fringes, to contrast brogues and black braces. 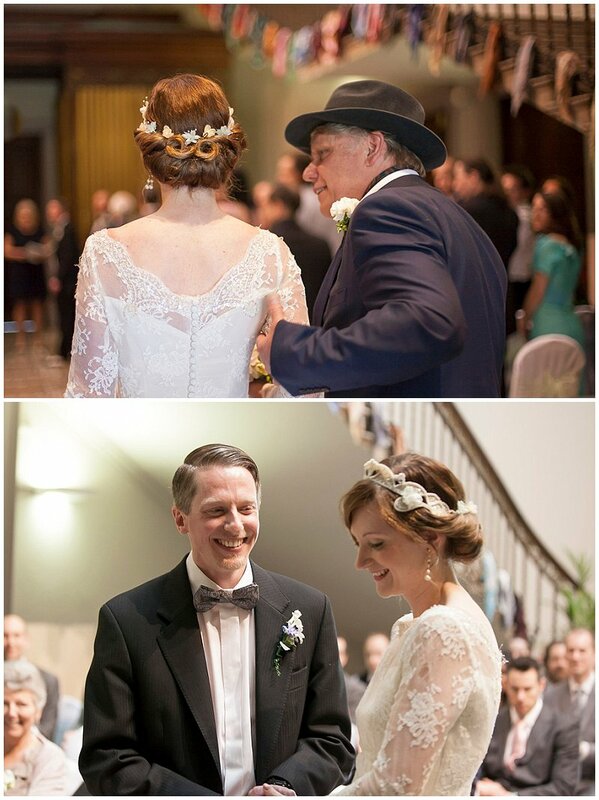 Even the guests had joined in on the fun, with 1950’s style prom dresses, red lipstick and feathered hats. 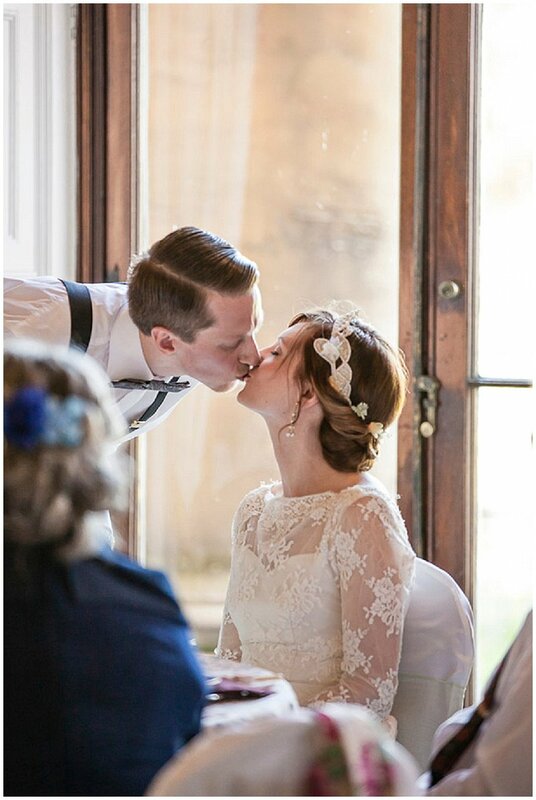 This wedding really was vintage done well. 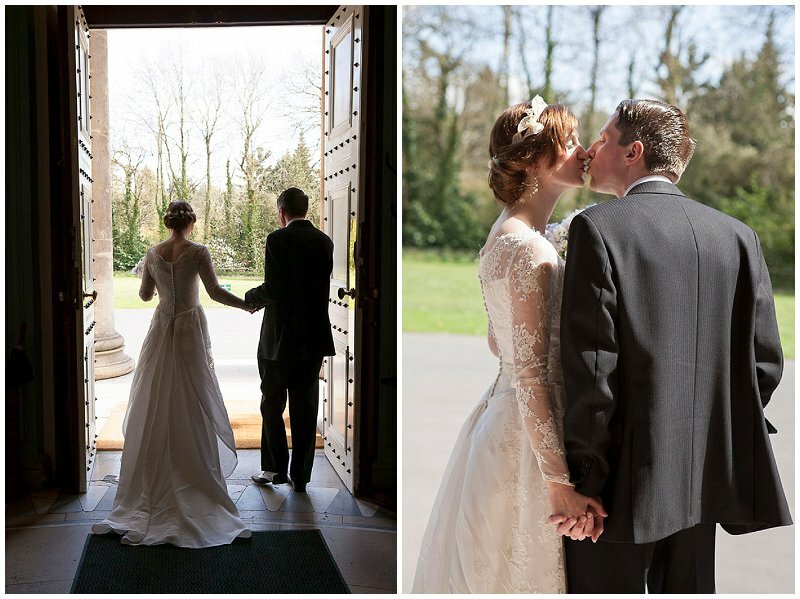 Vintage cars transported the bridal party to Leigh Court and they were whisked away to an upstairs room to prepare for the ceremony. (Elements of the day like this created a really traditional feel to the proceedings, and including a greeting line after the ceremony) The sun was well and truly shining and remained bright well into the evening, allowing guests the pleasure of sitting outside and enjoying their pimms – probably for the first time this year! 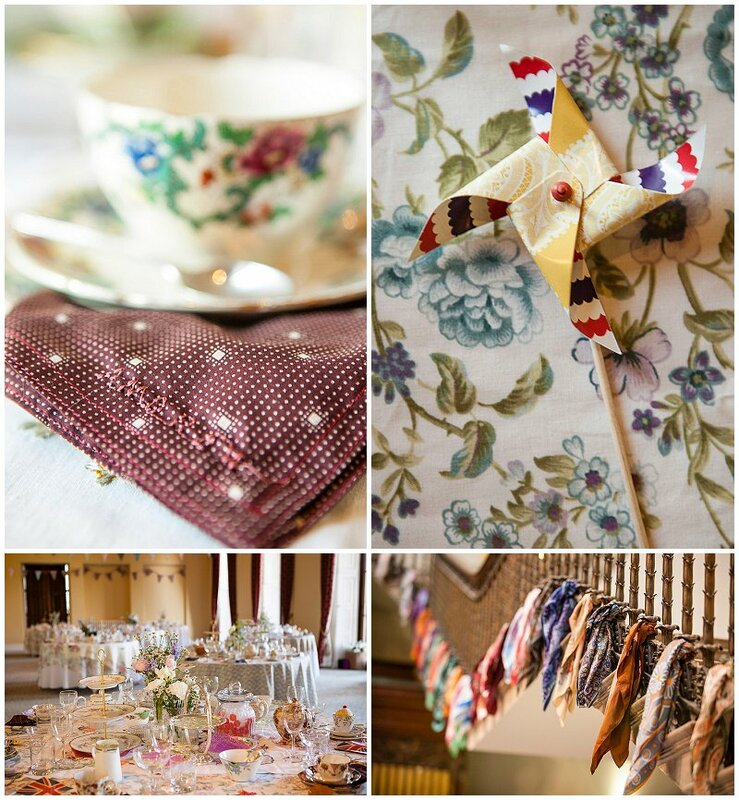 Thanks to the Vintage China Hire, the dining room had been transformed into a tea party fit for a queen (and her king!). 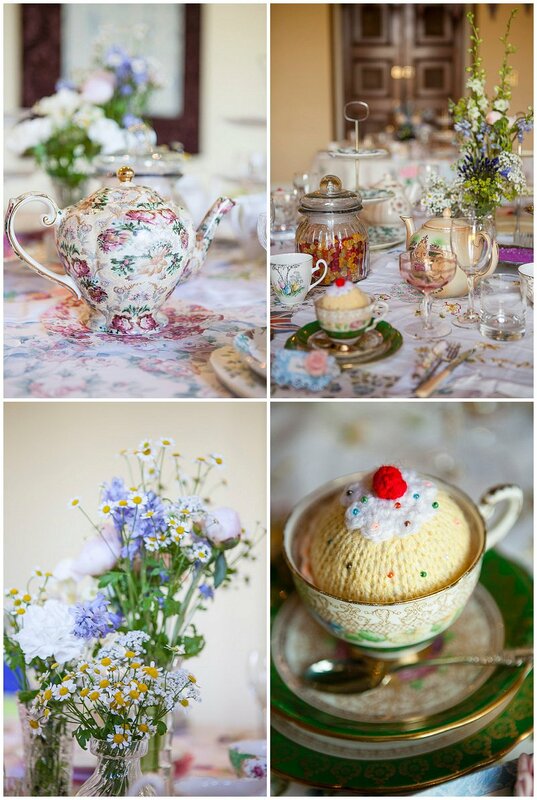 Delicate vintage teacups, mismatched with ornate teapots, floral doilies and china cake stands provided the basis of the table setup. It was the intricate details and personal touches which really made the difference, female guests were gifted with hand knitted cupcakes, created by Laura’s mother, whilst the male guests were treated to personalised handkerchiefs. Miniature crackers provided an ingenious icebreaker around the tables, and wild pastel toned seasonal flowers were scattered in glass vases. The group shots soon turned into a pose off, with the ushers and groom attempting out out pose the modelesque bride and her bridesmaids. The boys flashed their brogues, and emulated the suave gentlemen of the 1940’s era. Whilst the girls undertook a very editorial look and showed the boys how its done! 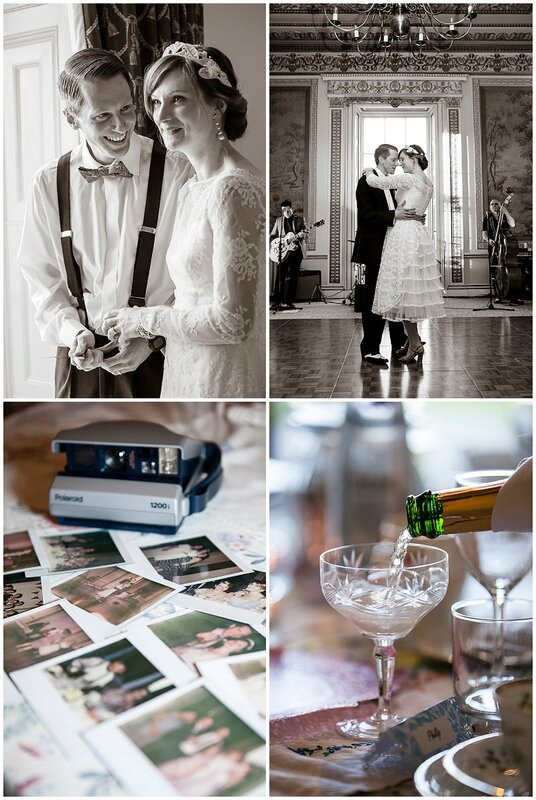 The entire day was a flawless blend of vintage and tradition, with family and close friends sharing the day together. The evening entertainment included a rockabilly band, and outside barbecue, a lovely relaxed evening to top off a perfect wedding day. Congratulations to Mr and Mrs Brown! This entry was posted in Real Weddings and tagged bridal dress, bride, bride and groom, bridesmaids, decor, fashion, tradition, vintage, vintage wedding, Wedding, wedding flowers on June 25, 2013 by laceinthedesert.